Hollywood Gorilla Men: Monster Gorilla Unleashed ! It's finally here and ready to purchase, my fellow Monkey Movie Maniacs ! Monster Gorilla is a delightfully fun tribute to most of our favorites in classic simian cinema. You'll see nods to such classics as The Ape Man with Bela Lugosi, Bride of the Gorilla, Nabonga, and White Pongo ! There are literally dozens of scenes inspired by these and many more of your favorites ! 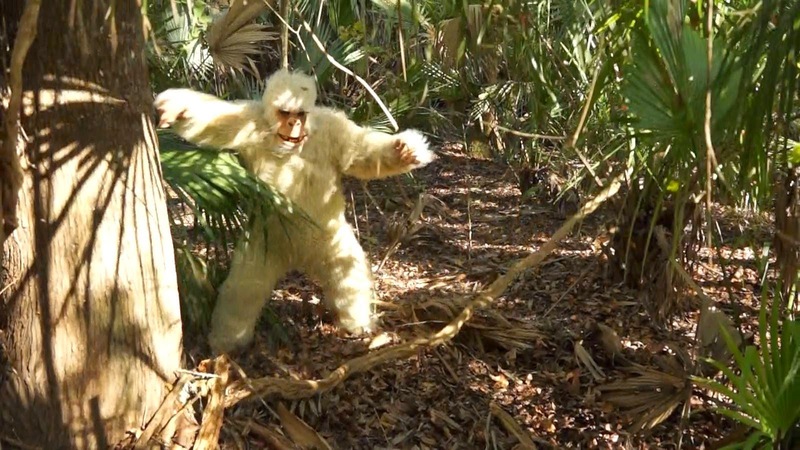 Monster gorilla came about as a short film contest sponsored by our Facebook sister site Ape Suit Cinema. Craig Scott Lamb, the administrator of ASC asked for submissions to enter, with the winner to be shown at the Ape Suit Cinema sponsored Jungle-Con ! Monster Gorilla won the contest, and will be featured in the program! Monster Gorilla stars the stunning Heather Brinkley as a ship wrecked Damsel, washed ashore on a mysterious island...and evil island. The island is inhabited by the maddest of mad scientists, the deranged Doctor Vornoff, played with scenery chewing brilliance by Bill Fredericks. Bill channels the very essence of Bela Lugosi at his hammiest ! The hapless Heather falls into Vornoff's evil clutches and prepared for an evil experiment...Vornoff actually plans to ....NOPE !!!! I'm not gonna tell ya ! A gorgeous girl running for her life ! Mad science gone wild ! And the most vicious gorilla battle ever captured on film!!!! This throw-down makes the gorilla fights in White Gorilla and White Pongo look like a thumb wrestling match in comparison ! Monster Gorilla was written by your humble simian servant Bongo under my human guise of Chris Casteel. 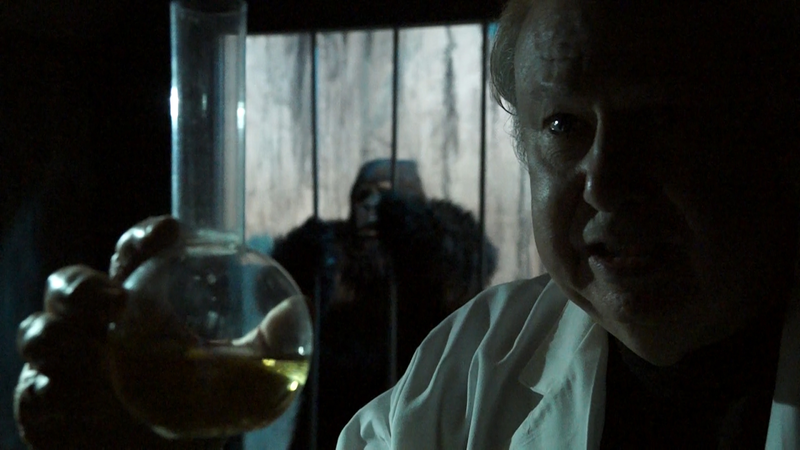 Monster Gorilla was produced and directed by the incomparable Bill Black ! Monster Gorilla also stars Scott Mena, and on the all important gorilla front Chris Casteel, and new gorilla sensation, (and my daughter) Kelley Young !!!! 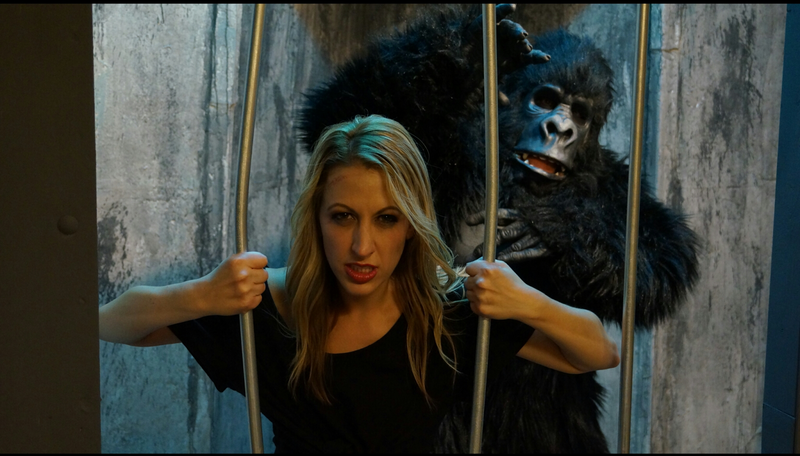 A real live gorilla girl ...Though Kelley plays a male gorilla here with all the ferociousness of Crash Corrigan ! The 30 minute version of Monster Gorilla in living color OR glorious Black and White !!!! The 20 minute black and white "contest cut"
Footage taken from SyFy Saturdays Bartow , which hosted the world premier of Monster Gorilla in front of a live audience, and guest appearances by Heather and Bongo ! And saving the SUPER BONUS for last....A collection of some of the finest photos of classic gorilla men ever assembled ! These come from the collection of Bob Burns, the expansive Hollywood Gorilla Men Archives, and the gorilla historians at Ape Suit Cinema ! Where can I get this amazing DVD you ask ? Right here ! Just click the EBAY link to order yours today ! And...tell 'em Bongo sent ya ! Have a sneak peak here ! Grooming your gorilla with George Barrows !